In my experience with off-grid electricity, it seems that energy storage is the most expensive and troublesome part of the whole thing. The conventional wisdom is that good old lead acid batteries are still the most cost effective solution, and that AGM batteries are nice for a low maintenance solution if you are willing to pay more. All of that works out pretty well, until I have about 3 or 4 days without sun. Then, I start to see that I need a bigger battery bank. But the batteries I have are already the most expensive part of the system. I wonder if there is any sort of DIY solution to drive down the cost of energy storage? Have any of you tried anything like this? A wood-gas powered generator to recharge the batteries might be a way. 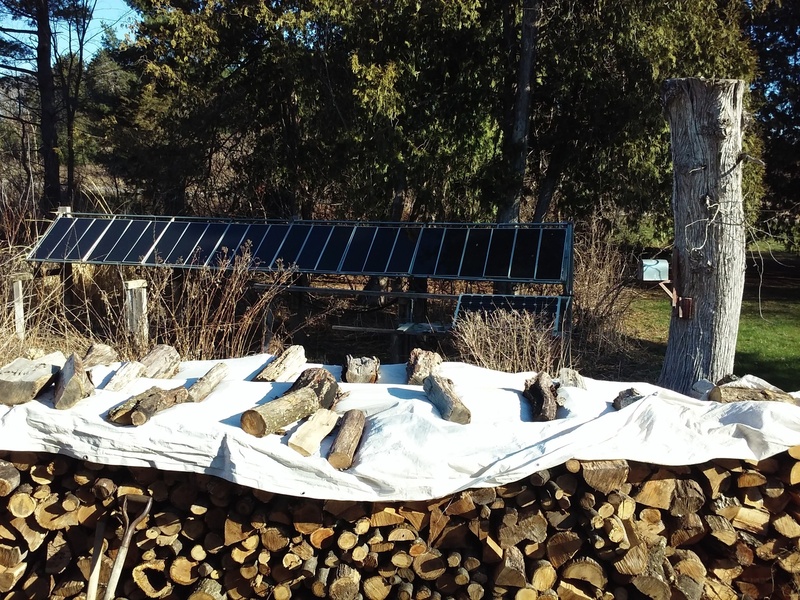 Wood seems like the ultimate solar energy storage. Hi Kyle. Those salt batteries look very promising. Cheaper to make but still very expensive to buy. You get to a point though where the best option is generator recharging… It is what drew me into the wood gas world; Forests are a great solar battery. I guess I have been looking at this from a “solar” perspective, since that is where my experience is so far. I have yet to complete my first wood gas project, but it is coming along. But I have been thinking of the things as separate. Wood gas for transportation. And solar (and/or hydro) for the house. But I guess I need to be thinking about wood gas as a “backup plan” for those inevitable stretches of cloudy weather. Funny how the obvious sometimes eludes me. I have a small solar set up in my garden roughly 1 KW That’s split into 2 and that charges a 12 volt and a 24 volt battery banks made up of very old deep cycle Trojan batteries . During the summer months I have no problem running everything in the shed and house, apart from the kitchen oven , and as long as we have had a nice sunny day the batteries will last till the next morning . During winter is when I struggle with sunshine and that’s where my charcoal gasifier comes into its own , simple to make fuel ( shovel coals from wood fire heater that runs 16hours a day ) simple to build simple to run and a simple car and truck alternator on a 13hp engine , and that brings the sunshine back to my batteries . Really, electrical generation is an excellent application for wood gasifiers. It doesn’t really need to be light weight or compact like you would ideally want on a vehicle and since you have extra room, you could add extra scrubbers without compromizing space… Also, since generators typically run at one speed, so getting the correct oxygen/fuel mix would be a once-and-done setting. oxygen/fuel mix would be a once-and-done setting. The amount of restriction in the char bed will dictate the fuel /air ratio setting of the motor. If the restriction in the char bed remains the same there would be no need for any adjustment of the fuel air setting once it is set … However this restriction ( coarse vs dense ) is usually changing to some degree . I have found in most cases if the char bed starts out coarse ( little restitution ) a more open air setting will be needed… After the gasifier is run for some time the fines start to accumulate and the restriction will increase . At this point the air setting needs closing some to keep the correct setting . If the restriction gets to be too much it may require a flick of the grate shaker to loosen the char bed and another air setting is needed . Sometime if the char bed is getting restricted some char may fall off the side of the grate ( small internal avalanche of char ) to correct itself. In short the restriction of the char bed is usually dynamic even if the draw of the gasifier remains the same . We might see if some others will chime in to see if they have had the same experience ? Wayne, you keep making the 75 percent easier to reach. 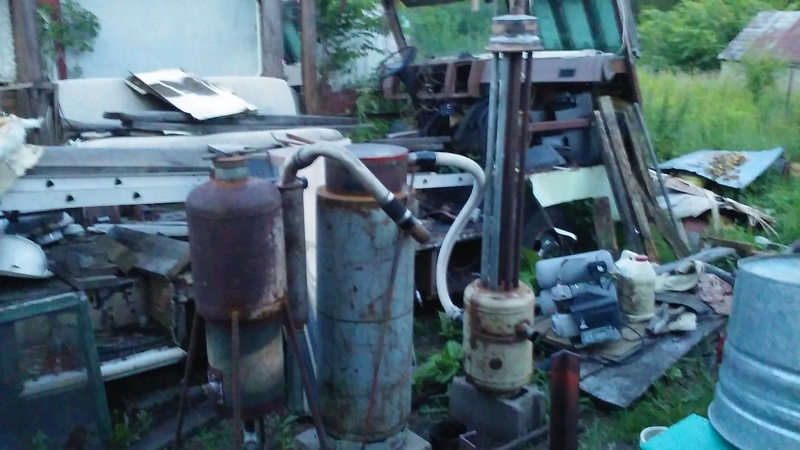 My plan for backup battery charging the off grid solar system that I am building is propane first (running a 10 KW Kohler generator), and then a Ben Peterson wood gasifier sized to run a 25 KW generator. With the derating of the generator for woodgas, I hope to get 10 KW out and into the battery chargers. I don’t plan to have any fancy controls on the system except those already on the gasifier grate shaker, no fancy auger feeds, ect, just load the wood, start the system and run it until the generator until the gasifier runs out of fuel. It looks time/effort prohibitive to try to run woodgas 24/7. I have the plans from www.woodgasifierplans.com. This is a very complete set of plans, particularly if you also get the videos and CNC parts cutting drawings. I have not built it yet but have spoken to two folks that have completed the design builds. Welcome. Nice looking machine you built. My father sending me this. Et si vous participiez au prochain événement de l’équipe TEDxParis ? André Gennesseaux : Passionné de mécanique, André a développé.. I have a small solar setup 8 or 10 batterys charging . from the junkyard runs my tv @ lights . the gasifier helps a lot. How many watts are your solar pannels? 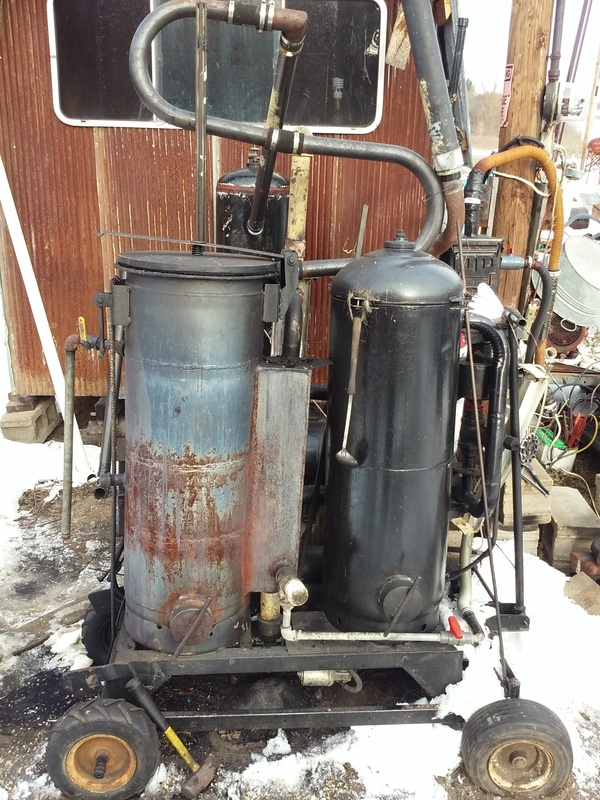 Are you running a generator off your gasifier? if so how many hours to charge up for the nite? One last question: are you totally off grid? Nice Bernie! Not sure why I haven’t seen this post before now. You would be better off buying whole panels online instead of harbor freight. They used to be the cheapest panels you could get but not anymore. You can buy monocrystaline 12 volt panels for around 1.40 a watt. Higher voltage panels get under a dollar. As for batteries, AGM’s are nice for vacation cabins since you can forget them and not have to worry. If you want long term off grid batteries, you need flooded. They tend to be more forgiving of abuse and can be fixed if you sulfate them. Look up a book called “the battery builders” on amazon. Shows how to build your own or recycle them. You can keep a set of golf cart batteries going forever if you have lead and some time. You can also build plante cells. Lower capacity but they last a LOT longer. Downside is they take 2 months to form. A good off the shelf option is a fork truck cell. Thick plates and high capacity 2 volt cells. With care you can get 10-15 years. With really good care you can get 20+ years. The best thing for a battery is to use no more than 15-20% its capacity. Everyone cites 50% but thats more good usage. The less you use the better. Also since most flooded cells can only be charged at 10% its 20 hour rate and your are likely to get less than 5 hours of sun, 50% might not get fully charged the next day, especially if you use any power. At 20% you are likely to end up in absorb by 11 am. Also, oversize the array and get a charge controller with a current limit feature. If you cant do that, max the array out to near or slightly above 10%. Its likely to never put out its full rated amount and if it does, it wont do it often enough to damage a battery in any significant way. Not as much damage as undercharging it does. The problem I have is my battery bank is to large. Its a 12 volt 1064 Ah battery bank. I need to charge it at a minimum of 60ish amps to full charge it. Thats not easy. To get a proper 10% charge is around 110 amps. No controller can handle that. I need two. Honestly for a 12 volt system, the max size I would do is 600 AH. You use solar for every day small stuff and wood gas for the big loads. I wish i had a good year round stream on my property. A water wheel can be built cheap and provide amp power along side solar. I think this might go in the plausible catagory for homemade batteries. Interesting I have seen that one before and the 1500 cycle life seems low but it is still early lab work. I think for the next 10 years aquion has a more viable product. Home made batteries scare me from an insurance perspective. It is alot of energy to store with risk involved I am concerned if anything went wrong they would blame your battery system.